Posted 13th December 2017 & filed under Uncategorised. Just across the Syrian border from Jordan, Daraa and its surrounding area is currently enjoying a fragile peace. The area’s doctors and nurses, many of whom have themselves suffered losses, are struggling doggedly to provide good healthcare to a population traumatised by war. PCI is working with the WHO to support these health workers as they prepare to receive and make use of new Non-Communicable Disease Emergency Kits. This is being achieved by working with WHO partner organisations based across the Jordanian border in Amman and who support primary healthcare services in the Daraa area. 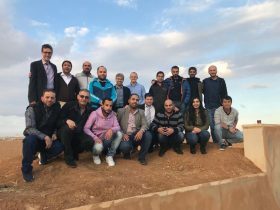 Last month, in November 2017, they organised for some of the doctors and nurses they support to cross the border and come to Amman for a week’s training in NCD care. This training underpinned the kits that the WHO is just about to deliver, each containing the basics needed to provide NCD care to a population of 10,000 for three months. It was touch-and-go whether our Syrian colleagues would be allowed across the sensitive border. But, during a long Saturday preparation meeting in Amman, we cheered quietly when news came through that twelve had made it across. Training began the next day. This was an unusual project for PCI: we were delivering the training alongside excellent trainers from the Amman-based NGOs with which we were working. These were people who shared our values of evidence-based medicine, patient-centred care and well-run chronic disease management systems. PCI colleagues had previously run trainer-training for them. (You can read about that here.) Teaching in Arabic, our NGO colleagues interpreting for us, we worked our Syrian colleagues hard for five packed days of training. We don’t remember ever teaching so enthusiastic or energetic a group. For some it was their first time outside of Syria; for most it was the first training they had received in years. Lively and ever good-humoured, their assessment results more than doubled – to outstanding levels – and they were soon working out plans for improving NCD care in their own services. They updated their knowledge of topics like COPD, hypertension and heart disease, and developed their skills for training their colleagues. In a session on diabetes they asked us to provide the evidence supporting our training that metformin is safe to use at all stages of pregnancy. We provided them with copies of the abstract of the key systematic review. Within minutes our participants had spontaneously shared the abstract, and the change of practice, on WhatsApp with colleagues practising across southern Syria – with big thumbs ups from many from afar: the fastest cascade training we’ve ever seen. Our Syrian participants have made it back to Syria and already photos and videos of training sessions they’ve run for colleagues have been shared with us. PCI will be providing remote support to colleagues in the Amman-based NGOs and, through them, to the team of south Syrian doctors and nurses. In our NGO colleagues in Amman, we have a highly skilled team of NCD champions. Coupled with the commitment and motivation of the newly-trained clinicians in the Daraa area, we look forward to seeing real improvements in NCD care far reaching far beyond PCI’s immediate role as facilitators and mentors. Calling All GPs Down Under – Want To Teach For GP Update? PCI’s Annual Report 2017 is out now!